I bet you weren’t prepared to call Geraldo Rivera a hero today, but here we are. 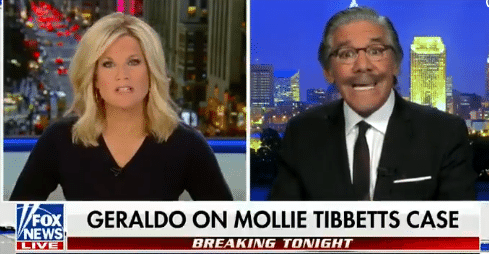 Last night on Fox News, Rivera leveled his employer, Fox News, for their racist coverage of the murder of 20-year-old college student Mollie Tibbitts, whose body was discovered earlier this week after she had been missing for a month. Tibbetts was killed by a 24-year-old immigrant from Mexico who has been living in the United States for between four and seven years. Her death has sparked national outrage and a debate, fueled by President Donald Trump’s fear of foreigners, between those who see this as a murder case and others who think American immigration laws are the culprit. Fox News has perpetuated the president’s narrative, and Rivera is having none of it. On Thursday, Rivera schooled host Martha MacCallum on why politicizing Tibbetts’ murder is so misguided — starting by repeating the pleas of Tibbetts’ family. Rivera then threw Fox News under the bus, calling them out for their “spin” on this sensitive issue. “Fox News is the only network fully covering the case,” a stand-in for Laura Ingraham said Wednesday night. Later on, in a Fox News appearance, the former Georgia Congressman said Tibbetts “was killed by a person who is exactly what Trump has been warning about.” You recall that Trump kicked off his bid for the White House in 2015 by referring to Mexicans as criminals and rapists who are “bringing drugs and crime” across the Southern border. “The left has to bear the burden of being the party that is tolerating Americans being killed by people who are here illegally,” Gingrich groaned. For Trump, inflaming his base’s fear of immigrants is a welcome distraction from what is easily the worst week of his presidency thus far.